Relative levels of expression determined by quantitative RT-PCR in 23 samples of FTA and FTC (black bars) and in normal thyroid tissues (gray bars). 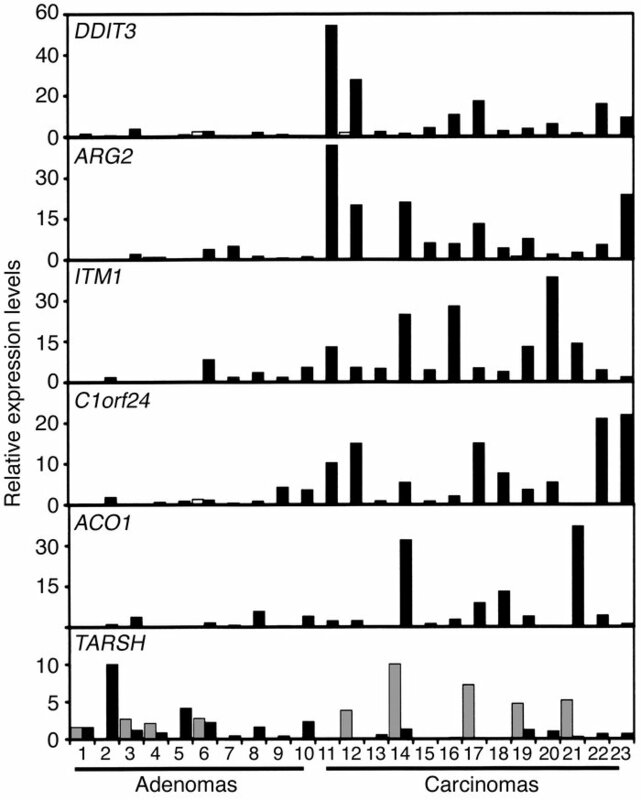 Transcript levels were normalized to the average of ribosomal protein 8 and t-complex 1, which were uniformly expressed in all three thyroid SAGE libraries. Numbers 1–10 correspond to FTA and 11–23 to FTC cases described in Table 2. The statistical analysis of RT-PCR values revealed that expression of the genes DDIT3, ARG2, and ITM1 was significantly different at the 0.05 level, and expression of C1orf24 was significant at the 0.10 level.